El Heraldo de la Revolucion was the official organ of the revolutionary government. 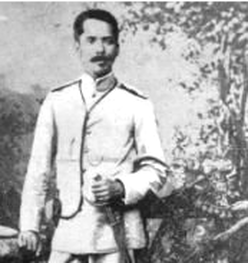 General Pantaleon Garcia was the only Filipino high ranking officer in his post north of Manila when the shooting started on February 4, 1899. The souring of Philippine-American relations that began before the mock battle of Manila intensified after the signing of the Treaty of Paris. President McKinley's "Benevolent Assimilation" proclamation was received by Filipino leaders with contempt and a sense of betrayal. General Aguinaldo issued a counter proclamation denouncing the American actuation; stating in no uncertain terms, the readiness of his government to fight for its territories and protesting U.S. intrusion on Philippine sovereignty. ". . . That all my brothers shall be protected, my conscience forces me to further protest against the intrusion of the United States in the Filipines, and I equally protest in the name of all my people against the policy of the United States. The people of the Filipines have given me a vote of confidence and I will struggle for liberty and independence until death. . . ."
This was published in "El Heraldo de la Revolucion" on January 5, 1899. At this time, the U.S. forces were poised to occupy Iloilo in the Visayas. Later however, Aguinaldo tried to diffuse the growing tension by inviting General Otis, who was designated as Miliitary Governor to send representatives for a discussion with Filipino counterparts. Six commissioners, three Americans and three Filipinos started to meet on January 9, 1899. Meetings were held irregularly and without effect. Again, unknown to Aguinaldo, Otis was just waiting for U.S. reinforcements and using the meetings to buy time. Meanwhile, hostilities between Filipino and American troops continued to escalate. The heightened animosity was caused by the demarcations between the two armies’ defensive positions or “territories” such that challenges or protests were invariably issued for any perceived or alleged territorial intrusion. Although no actual shooting had occurred, to the eyes of Filipino troops, their erstwhile allies were increasingly acting as conquerors. While the atmosphere in Manila was tense, the Malolos congress continued its task. A republican constitution was promulgated on January 21 and on January 23, the first Philippine republic, the first republic in Asia was inaugurated. But in the evening of February 4, 1899, fighting in Manila broke out when Pvt. William W. Grayson of the First Nebraska Volunteers and another soldier Orville Miller, shot Corporal Anastacio Felix of the 4th Company of the Morong Battalion of General Luciano San Miguel and two other Filipino soldiers in Santa Mesa near San Juan in Manila. Filipino troops reacted and returned fire. The following day February 5, without bothering to investigate, General Arthur Mac Arthur ordered American troops to advance against Filipino positions. Fierce fighting ensued over a 25 kilometer Filipino and American lines. 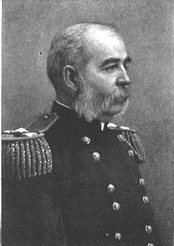 Admiral Dewey’s guns pounded Filipino positions resulting in enormous casualties. The American press that relied mainly on dispatches from the government and the military labeled the Philippine army as insurgents. 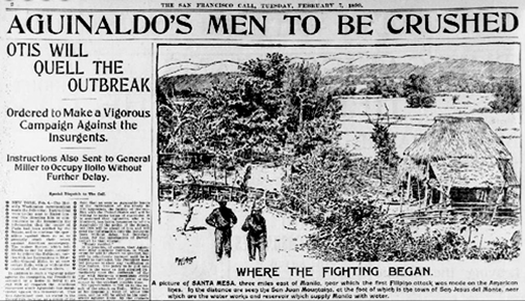 A San Francisco newspaper reported on February 7, 1899 that the February 4 incident was a Filipino attack on the American lines. Former U.S. President Grover Cleveland and industrialist Andrew Carnegie opposed the annexation of the Philippines. Nonetheless, Aguinaldo, desirous of finding the truth ordered Felipe Buencamino to investigate. Buencamino later reported his findings that two days prior to the incident, Filipino workers on American ships were suddenly dismissed; and that about 200-300 American troops sent from Manila to Cavite the morning of February 4 did not disembark but were immediately ordered back to Manila. Buencamino further noted that February 4 being a Saturday, senior Filipino Military officers were on traditional weekend leave and not at their posts when the incident happened. This report seemed to imply that American generals were for some reasons anticipating trouble during that particular weekend. It also raised the question of whether some American commanders might have taken advantage of the absence of senior Filipino officers to issue aggressive orders to their men that could have provoked armed confrontation in vaguely defined and contested territorial demarcation lines. Mac Arthur’s immediate all-out attack the following day without the benefit of an investigation; and the military governor, Major General Otis’ outright dismissal of a peace talk proposal seemed an indication of compelling imperatives to promote escalation of an armed conflict. While it could have been a coincidence that the Treaty of Paris was being debated in the U.S. Senate, the timing of the chain of events seemed too calculated and significantly close to the ratification of the treaty which was scheduled for February 6. The ramification was also difficult to dissociate from the ruse and treachery that characterized the mock battle and “capitulation” of Manila to the exclusion of the Filipinos. To take effect, the Treaty of Paris, although signed by its Spanish and American commissioners had to be ratified by each country’s senate (or parliament). Felipe Agoncillo on January 30 wrote a memorial addressed to U.S. Senators appealing for recognition of the Philippine right to liberty and self-government. The treaty needed two-thirds vote to be passed, and it looked like the Democrats had enough votes to block its passage or at least create a deadlock. Aside from this, there was a strong lobby from the “Anti-imperialist League” which had former Secretary of Treasury, Senator George S. Boutwell, House Speaker Thomas Reed, philosopher Henry James, writer Mark Twain (Samuel Clemens), and industrialist Andrew Carnegie as main oppositionists to the war and American expansionism. Republican Senators George Frisbie Hoar, George Graham Vest and former President Grover Cleveland were also outspoken opponents of the treaty. In Washington, the February 4 incident was quickly exploited by pro-annexation propagandists and the press who put the blame squarely on the Filipinos. 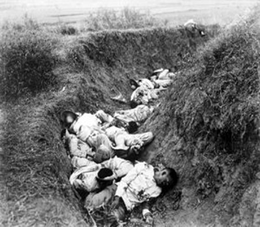 At least 3000 Filipino soldiers, having no senior officers in command at that time were caught unaware and massacred in the ensuing American offensives. On February 6, 1899 when President William McKinley told the American people that the Filipinos attacked the U.S. forces, the tide of public censure suddenly broke the parity of opinions in the U.S. Senate. Voting 57-27, the Treaty of Paris was ratified. On March 19, it was likewise ratified by Spain when the Queen Regent, Maria Cristina broke the deadlock in the Spanish Parliament thus, officially ending the short, three-month Spanish-American war. But while Spain had peacefully retreated to nurse its losses, the United States had just entered into its war of annexation in the Philippines; an unwilling new possession, whose resistance would last until 1913. ​The Tragedy of the Republic/the First Philippine Republic at War; Sources: IGLPI Journal No 3. Independent Grand Lodge F&AM of the Philippine Islands. Cavite: December 2010. Agoncillo, Teodoro A. History of the Filipino People, 4th Edition. Quezon City:1973. Library of Congress. http://www.loc.gov/rr/hispanic/1898/chronspain.html. (accessed Aug. 17, 2010). http://www.univie.ac.at/voelkerkunde/apsis/aufi/forbes/forbes55.htm. (accessed Aug 10, 2010). Beck, Sanderson. http://san.beck.org/14-11-Philippines.html. (accessed Sept. 30, 2010). http://www.homeofheroes.com/index.html. file:///G:/16_trouble.html. (accessed Aug. 6, 2010). http://www.globalsecurity.org/military/ops/philippines.htm. (accessed Aug 10, 2010). http://americanhistory.si.edu/militaryhistory/printable/section.asp?id=7. (accessed Aug 10, 2010). http://en.wikipedia.org/wiki/Philippine-American_War. (accessed Aug 10, The Far Eastern Free Mason. Manila: April-June 1992. IGLPI Journal No 1. Independent Grand Lodge F&AM of the Philippine Islands. Cavite: November 2008.